Why are Greek affairs in the spotlight even at the White House? Greece is called the cradle of European civilization. In the XXI century the difficult fate of the country led it to the position of the principal debtor within the Eurozone, forced to ask for a massive financial support, especially in countries - its partners in the EU. In April the German newspaper Handelsblatt cited Vice President of the European Commission Valdis Dombrovskis, responsible for the Euro and Social Dialogue, that the official assumption regarding the Greek economy development in the current year would be reduced affecting conditions of its external lending. Later on the European Commission predicted the Greek economy would grow by only 0.5 per cent of GDP this year, down from an optimistic 2.5 per cent projection made just three months earlier. There is no doubt that the Greek economy needs a deep rehabilitation and counts on the support and attention from both the EU Member States, and other countries - its traditional partners. Many Europeans perceive positively that under these circumstances Greece has proved to be a country that is seeking to rely primarily on its own capabilities. The country is really looking for their own independent solutions that can positively impact on its economic status. In a harsh economic situation the geographic location of Greece becomes an especially valuable gift of fate, since the country is located between the world's largest suppliers of natural gas and the European countries, especially its neighbors in the Balkan region, which need this kind of energy very much. It gives Greece the opportunity to participate in construction and further maintenance of new pipelines to supply gas to Europe. It is indicative that after Turkey other Balkan countries together with Greece also confirmed their intention to participate in the transit of Russian gas to Europe. They declared about it at the Budapest meeting of foreign ministers from Greece, FYR Macedonia, Serbia, Hungary and Turkey on April 8. The main objective of this meeting was to coordinate efforts for creating a united infrastructure to distribute the gas delivered from third countries. It is not difficult to see that this objective complies with the problem posed by the European Commission in order to eliminate the so-called "energy islands" existing especially in the countries of South East Europe, where national energy markets are operating separately without a proper technical connection with the energy networks of other EU countries. However, despite this seemingly worthwhile convergence of the European Commission and the Balkan countries’ intentions regarding the development of the Europe's gas transmission system, in reality there is no consolidation of Brussels and the Balkans on this, of course, the most important task in the energy sector. The European Union does not support, but rather warns Athens on prospects of participation in the Turkish stream project. In an interview with regional German newspaper Muenchner Merkur European Parliament President Martin Schulz told: “Greece demands and gets a lot of solidarity from the EU. We can therefore also ask for solidarity from Greece and for this solidarity not to be ended unilaterally by pulling out of joint measures". Obviously, in the energy sector these joint measures meant to follow the requirements of the EU Third Energy Package, according to which it is illegal to own a pipeline and produce the natural gas that flows through it at the same time. Many Europeans still remember how the European Commission blocked the South Stream project applying the Third Energy Package last year. In fact, a negative role in this story was played by Bulgaria, which did not grant Russia the authorization for construction in its territorial waters and on land. Thus, Gazprom was not able to proceed with the project. It resulted in a dramatic failure of Bulgaria's plans to become a transit country and a major gas hub in South East Europe. There is a completely different situation now compared to last year because the Turkish Stream project is to be implemented outside the EU and beyond the borders of the EU legislation. However, although such means of pressure on the Russian gas project disappears, there is still the purpose, for which it is done. Chairman of the Board of Gazprom Alexey Miller at the conference "Europe and Eurasia: Towards a new model of energy security" held in Berlin pointed out that the main purpose of blocking by the European Commission the South Stream project was to preserve the transit of gas through Ukraine. Actually there is hardly anyone who still doubts that Ukraine has nothing to do with it. As many of you are aware, the United States played a major role in rising the new regime to power in Ukraine and continue to support it by all possible means. That is why after Russian President Vladimir Putin and President of Turkey Recep Tayyip Erdogan agreed to bypass the transit routes through Ukraine last year, the Turkish Stream project became the new target for the White House and, accordingly, Greece too, since the gas pipeline is to be destined for this country. The US reaction to the interest shown by Greece with regard to new opportunities to develop its energy sector was fairly predictable. Especially after Greek Prime Minister Alexis Tsipras held talks with Vladimir Putin during his visit to Moscow, the US stepped up attempts to influence the prospects for the gas pipeline along Greek territory. 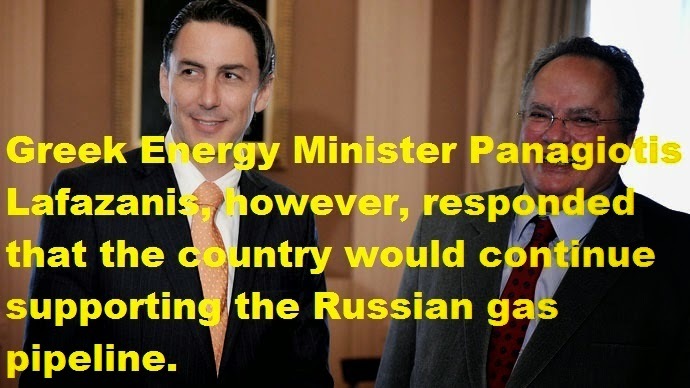 Repeating a familiar scenario of Bulgarian confrontation against the South Stream project, as if a full-time crisis manager, Amos Hochstein, Special Envoy and Coordinator for International Energy Affairs visited Greece on 7 - 8 May. In contrast to the words of politicians from Brussels mentioned above as they sounded more or less like the language of diplomacy, during the talks in Athens with the Greek Minister of industrial Reform, Environmental Protection and Energy Panagiotis Lafazanis the US Special Envoy directly stated that the US most certainly does not want this pipeline. Covering the visit of Amos Hochstein to Greece, The New York Times in an article entitled "U.S. Urges Greece to Reject Russian Energy Project" emphasized “That pipeline would carry Russian gas to Europe through Turkey and Greece, bypassing pipelines that run through Ukraine”. As indicated in the press release of the US Embassy in Athens following the visit of Amos Hochstein, instead of participating in the Turkish Stream project Greek side was proposed to concentrate on the Trans Adriatic Pipeline (TAP), Greece-Bulgaria Interconnector (IGB), and expanded use of Liquefied Natural Gas (LNG). In the press-release without reference to any economic grounds it is alleged that TAP would result in 1.5 billion Euros in foreign investment in Greece, generate 10,000 jobs during construction, and provide many millions of Euros in revenue annually over 25 years. However, the real situation with the TAP gas pipeline does not correspond with these promises. Although Athens already determined the route of the Greek section of the pipeline, there is no agreement with Baku on the most important financial component of the TAP deal. Even transit tariffs have not been agreed yet. The US advices regarding LNG seem very vaguely, taking into account that Greece at first will need to build an expensive regasification terminal. In this regard, the statement made by the US Embassy, which calls for relying on these projects to improve energy security and reduce Greece's dependence on a single gas supplier looks like so much realistic, using the images of the world famous ancient Greek art, as a fig leaf on the ancient statue. Therefore, it is logical that after talks with Amos Hochstein Greek Minister Panagiotis Lafazanis confirmed: “We want a multilevel and independent energy policy that will be formed exclusively on the basis of our national interest, the interest of the Greek people and, of course, the cooperation and energy security in our region and in Europe”. How far the consolidation process in favor of national interests will go on further the next meeting of foreign ministers of the Balkan countries and Turkey reveals in July 2015, where imports of gas from Russia will be discussed among other significant issues. Why wouldn't we wish the countries of South East Europe to withstand these tests of their commitments’ strength to maintain an independent energy policy pursuing its national interests? p.s. In this situation, the position of the Greek government will continue to be of particular importance for the energy future of the entire region of South East Europe.